What equipment do you need for PA School? This was a question I had as a nascent first year PA student excited to get my hands on a “real” stethoscope. At the time, I just listened to whatever my school recommended and bought most of my PA school equipment from the bookstore. Bad idea on both counts. After a decade’s worth of trial and error and real-world use, the following is a treatment of everything your PA school says you should buy and what I think about it. 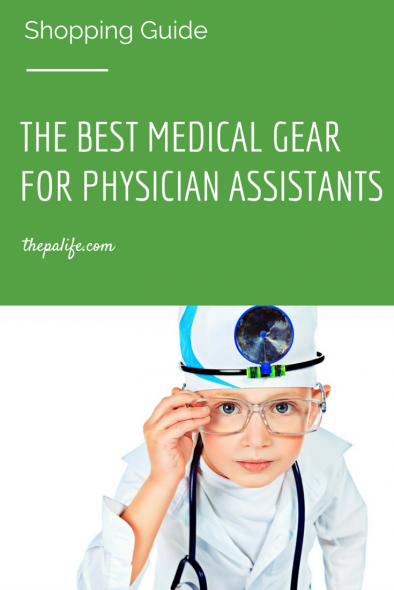 A reasonably good stethoscope is the one (and I mean one) and only piece of medical equipment that every PA student must purchase. You will use it during the preclinical didactic year for training and starting your second year you’ll use it almost every day (possibly for your entire career). Stethoscopes aren’t like ophthalmoscopes (see below); you really need to have your own, and it is absolutely worth it to have one that works well. Even though there is an overwhelming number of models at a huge variety of price points only three are worth considering. Because this is your one absolute essential, possibly career-long piece of equipment. I recommend not skimping. My overall pick is the Littmann Cardiology IV. 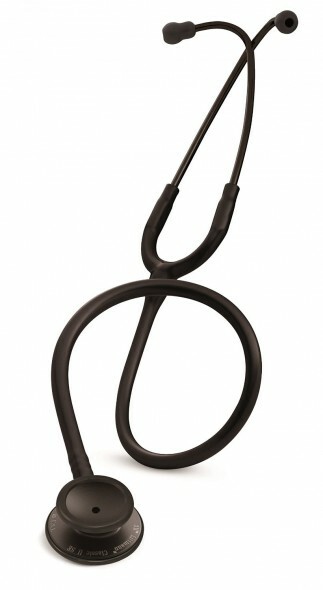 The Littmann Cardiology IV is a great acoustic stethoscope and is the gold standard. Most PA schools will say the same. 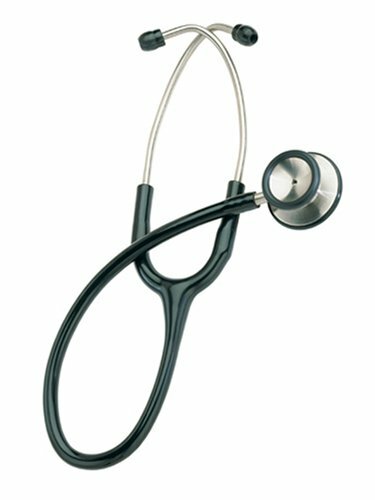 Having used almost every stethoscope on the market I find the Littmann Cardiology IV to be the only stethoscope that allows you to auscultate even the most difficult to hear heart sounds, especially in a loud clinic environment. It is a bit heavy when compared to the Littmann Classic III and my first one broke after 13 years of hard daily use and tons of curious pediatric patients playing with it. But in my opinion this is a no-brainer, buy the Littmann Cardiology IV and you will be very happy you did. 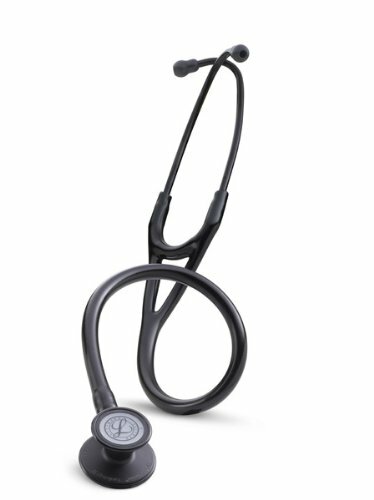 The Littmann Classic III is a very lightweight and well-built stethoscope with good acoustics although not as good at noise canceling as the Cardiology III. My wife (an RN with 14 years experience) swears by this one because she likes the lightweight feel and durability. I used this stethoscope for a year when my Littmann Cardiology III broke and I was too cheap to purchase a proper replacement. It wasn’t until I finally replaced my Cardiology III that I realized what I was missing. If you are a student with a tight budget this may be a good option. But I still think you should consider a worthwhile upgrade later. The ADC Adscope was my first stethoscope that I purchased for my EMT training. Continually ranked one of the best stethoscopes at this price point, the ADC Adscope is probably the best “entry level” stethoscope on the market. At $34 it is worth buying just to keep in your office in case you leave your Littmann Cardiology III at home. It has surprisingly great acoustics for a $34 stethoscope and I am always amazed at the sound quality. In fact it rivals (if not beats) the acoustics of the Littmann Classic II in noisy environments. I have given several of these away as gifts and I have a hard time keeping a backup in my office. A note on Amazon Prime for Students: I have carefully selected items on this page that are available through Amazon Prime’s fulfillment program. If you are a PA student you have the huge advantage of Amazon Prime Student which qalifies you for free 2-day shipping anywhere in the US on all orders. As an added benefit, you also have access to the entire Kindle Lending Library and Amazon’s Free Music and Video Library. Among all the retailers of medical equipment, I find Amazon to be the best. I once had an Amazon shipment stolen off my front porch. I emailed them explaining my situation and they shipped the same exact order a second time free of charge, and to top it off they sent it overnight mail! They also have an amazing return policy! Chances are your school is going to have a recommended diagnostic set, and chances are it will be what my school recommended: the WelchAllyn Panoptic set (the gold standard). This is a painful $750 investment that has its benefits and obvious drawbacks. You can see my feelings on this below. The good news is that even though your school may be recommending a $750 investment in your future is certainly is not required. There are a lot of super cheap sets available online, but if you ever plan on actually using them, then it’s probably worth upgrading slightly. The cheap ones are extremely heavy and optically useless. Either the light is too bright or too dim and non-adjustable. Not infrequently, the optic disc remains blurry no matter how you tweak it, because the manufacturing process doesn’t calibrate these devices accurately. Most otoscopes work okay (ears are easy), but you’ll almost always buy it as part of a set anyway. Which diagnostic set should you buy? 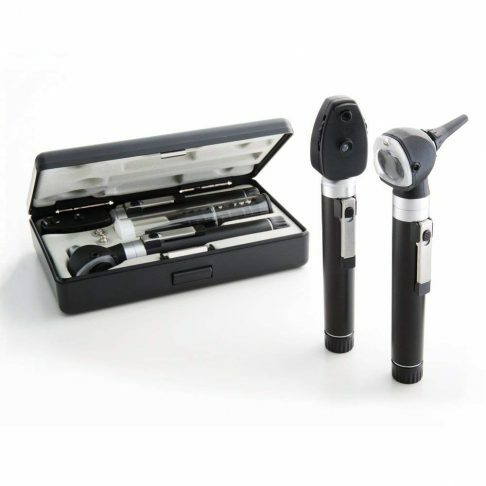 If you’re looking for a reasonable, affordable, small and light general purpose set, look no further than the ADC Otoscope/Ophthalmoscope Diagnostic Set. They’re well-made, durable, and actually work. They use AA batteries, so they’re small and can fit in your white coat easily (unlike their full-size C-battery-sipping cousins). For a pocket set, there’s nothing better. 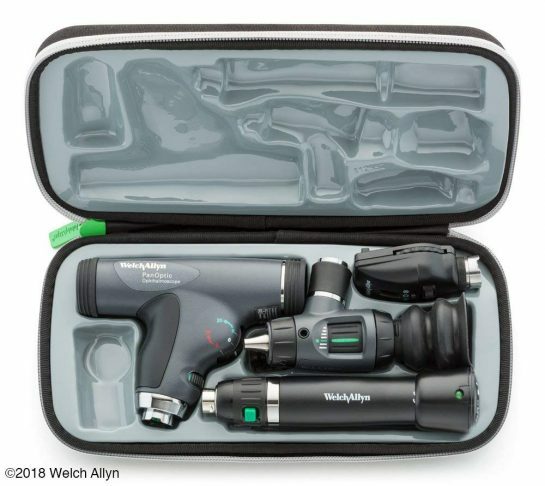 The best “reasonable” full-size option is the Welch Allyn Diagnostic Set , which is what you’ll find in just about every hospital setting. It’s big, it’s good, it’ll last forever, and it’s expensive. 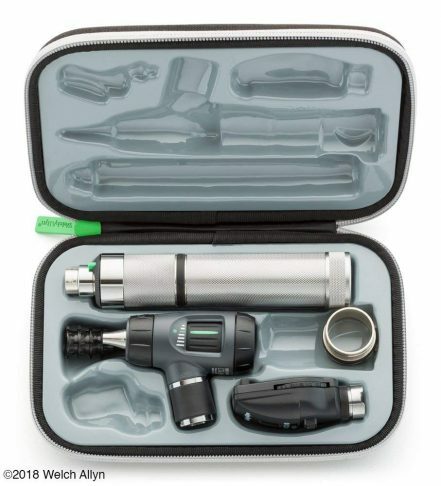 It doesn’t have the “PanOptic™” Ophthalmoscope of its pricier counterpart but that is not a big deal, as you will see below, you probably will never use it anyway. If you want the Rolls-Royce of sets, then you’re forced to splurge on the holy PanOptic™. To me, everything else in between just doesn’t seem worth it (if you’re really going to shell out $500+ for a Welch Allyn diagnostic set, why not upgrade all the way?). For most people, the Panoptic is a massive waste of money. Its main benefit is that you can do a much more complete fundoscopic exam without dilating the eye. As a consequence, you can accurately assess the optic disc and easily check for papilledema. 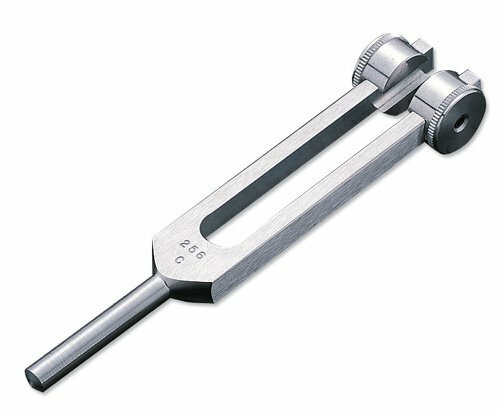 Consequently, for neurologists, the Panoptic can be extremely helpful in checking for signs of increased intracranial pressure. For ophthalmologists or family docs, the Panoptic is helpful for community outreach work and school screening, as it allows you to obtain a fast reliable exam without eye drops/dilation. For PAs who want to do community outreach, medical mission work, etc… it’s seriously something to consider. If you want to work in family practice and actually do a real fundoscopic exam, then a Panoptic head is probably the most straightforward way to do so in a routine clinical setting. You don’t even have to know how to use one properly; it’s just that much easier. So penlights are not the most exciting topic within medicine. However, I struggled with them a lot as a physician assistant student. As in, I never seemed to have one when I needed one. And, when I did have one, more than once it had died. It is hard to justify spending more than $5 on a penlight because chances are you will lose it. But, if you are organized and plan on keeping your penlight safe in your white coat (where it really belongs) then these 3 options are the best of the bunch. 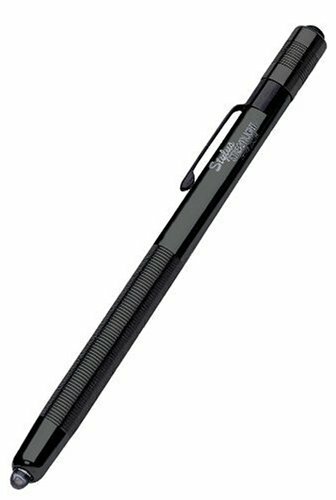 The Welch Allyn Professional Penlite is a Halogen Penlight which is a more natural light (versus LED) and is preferred by many professionals. 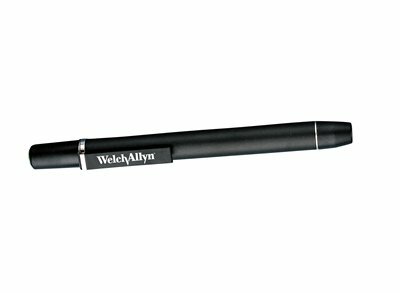 Welch Allyn which makes PanOptic™ ophthalmoscope lights (see above) knows how to make a good light and has done a great job on this penlight as well. It will last you 10 years if you treat it well and don’t lose it, but it will set you back about $50. This light also makes for happy patients as it is not too bright and not to dim. A good all around (but expensive) option. This is a great penlight. It’s around $10-15 depending on the day, but it’s super bright, lasts forever (like 60 hours on one set of batteries), and is as slim as a narrow pen, so it fits easily in the pen divider of a white coat with room for another pen, so I actually use it all the time. It’s reusable, as it takes 3 AAAA batteries. That’s right. AAAA. Where do you find AAAA batteries you ask (should you rack up 60 hours of pupil gazing)? Inside of the 9V batteries you used to stick your tongue on (and in stores, of course). 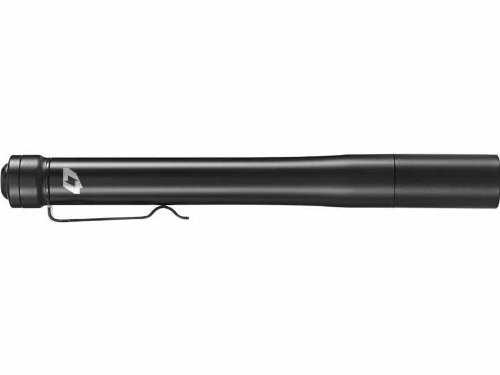 If you want the next step up, the Foursevens Preon 2 has multiple light modes (dim for carefree direct pupil, bright for room flooding) and is generally well loved as the most versatile LED penlight around (downsides: bit wider; click button means you can leave it on by accident and waste the battery). 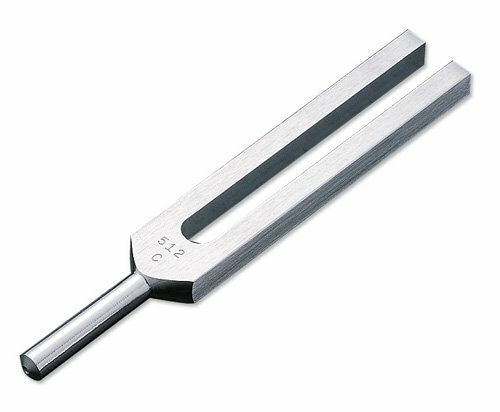 Chances are your PA school will also “require” you to buy two tuning forks, the 512 hz and the 128 hz . They’re cheap. The 512 is for hearing testing; you’ll only use it for standardized patient encounters/clinical exams and the like. In real life, you’ll be rubbing your fingers together instead. The 128 is actually useful, at least insofar as performing a proper neurological exam (vibration sense). You might actually carry it in your pocket on some clinical rotations. 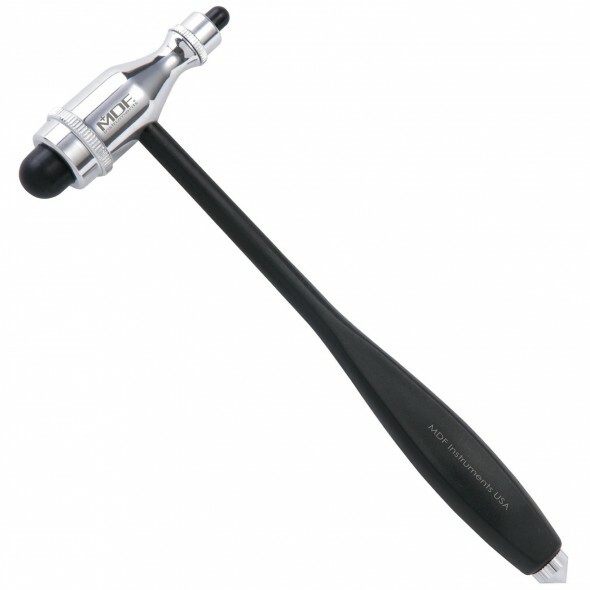 A reflex hammer is worth having, both educationally and clinically. If you want to elicit a reflex, throw out (or don’t buy) the tomahawk (called a “Taylor”) sold in your school’s bookstore. It’s junk. To get a reflex, you need skill and a hammer heavy and balanced enough to tap the tendon just so. The tomahawks don’t have the heft. The Babinski hammers (the ones with the circular or “Queen’s Square”-style head) are a good choice. They do the job and barely cost any more than the $2 cheapos. But the “best” white coat-able hammer styles (and the ones you’ll see the neurologists rocking on rounds) are the Trömner (and occasionally the Dejerine), which are also the most expensive (and some are absurdly pricey). If you don’t want to spend $20-40 on a reflex hammer but you want to learn and do a real neuro exam, then the Babinski is the reasonable middle ground. If you have a relatively substantial stethoscope (e.g. Littman Cardiology III), then the edge of the head is heavy enough to get reflexes in a pinch and will save your pocket the additional junk (not quite as professional though). If you have decent percussion technique, you can also tap out a knee jerk (but likely not the others) with your fingers. When it comes to choosing the right sphygmomanometer you don’t need to get to fancy. 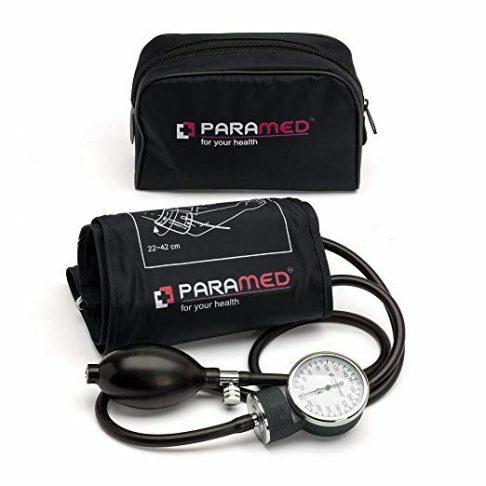 This Aneroid Sphygmomanometer with Durable Carrying Case by Paramed is more than enough to get the job done. It is well priced, has a nice full-sized cuff, comes in three colors (black, blue, or hot pink) and comes with a slick case to pack it all together. I have had mine for over 13 years, its been on two international medical mission trips and still works great! According to JNC8 digital blood pressure monitors are more accurate both in the office and in the home. Better yet, make it Bluetooth and connect it to Amazon Alexa and you have the perfect system. This is BP cuff we use both at home and in the office. 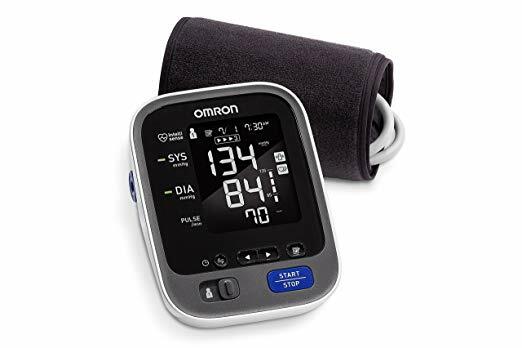 It’s accurate, has tracking for up to two users, and traces your blood pressure using a free app that even sends reminders. You don’t realize what a good pair of trauma scissors is worth until you try to cut your first piece of gauze with a bad pair. 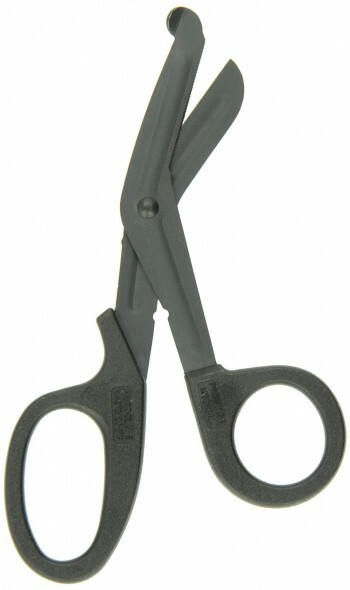 You don’t need to spend a lot and these scissors will get the job done. To top it off you can look like Bruce Wayne if you choose to purchase the “Dark Knight” version.. my personal favorites! You may never use this in a clinical situation but you are often required to purchase one regardless. You will probably have to pull it out a couple of times during your PA school physical exam training. Personally I find the one included with Maxwell’s Quick Medical Reference to be more than enough. There are also several FREE iOS apps (including this one) if you search the marketplace. 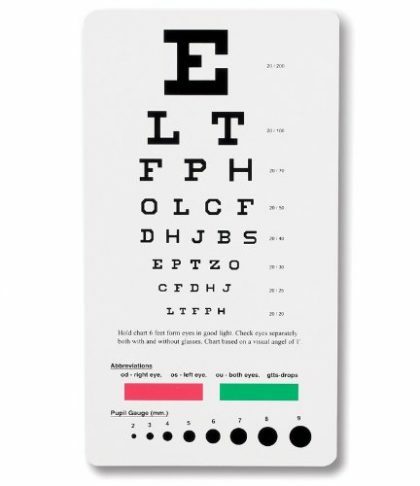 A good pocket sized eye chart that is plastic (and thus waterproof) so it should stand the test of time. In my opinion, the best medical bag is probably a nice labcoat with lots of pockets. A medical bag is good for storing your equipment in, but the reality of the situation is it’s not very practical for clinical use. This may be different at other institutions, but I know I have NEVER seen a single student bringing their equipment to a clinic or hospital. It may be nice to have a good bag to store the equipment in, but as for having a nice bag to carry your stuff with you is probably a little overkill. 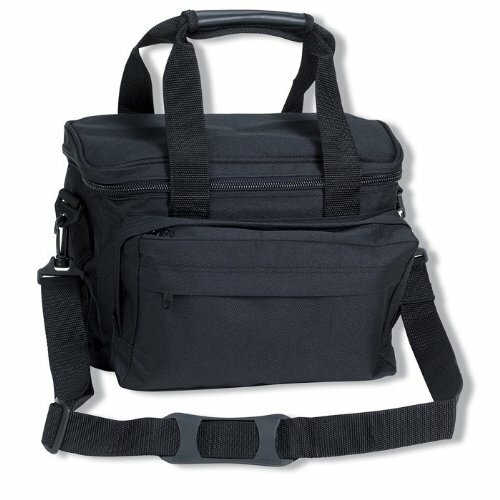 Because I had images of running to save the day with my medical bag, I purchased one and never really used it. It collects dust in my garage, but I guess it keeps my medical equipment and that expensive PanOptic set I purchased (see above) clean! Despite what I have said above, I have since done several medical mission trips and am interested in wilderness and survival medicine. A decent backpack with plenty of pockets or a prepacked duffel bag specifically for this purpose should do the trick If you are thinking of purchasing an all purpose medical kit just in case you need to save a life at home or from your car I think the following would be a much better option than purchasing a medical bag which holds a tuning fork that is rarely helpful in the event of an emergency. There are many kits on the market, you can assemble your own, or simply purchase a pre-configured set and add to it. I have seen some descent ones sold at warehouse stores like Costco and REI. These are two I would highly recommend for anyone wanting a good all-purpose kit. This kit is surprisingly extensive and includes supplies to treat basic and advanced illnesses or trauma, including: Glucose Gel, dental repair items, a scalpel, oral rehydration salts, a sterile scrub brush, and numerous bandages and dressings. Great to keep in the back of your car or when you are going on back country expeditions. 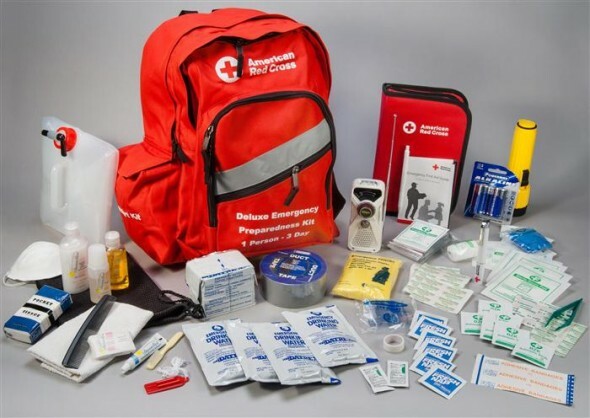 This kit is designed to be used in case of an emergency or natural disaster. It is a a great kit to keep in the home just in case an emergency strikes. It contains items such as a flashlight, water treatment capsules, basic medical supplies, emergency food and water. 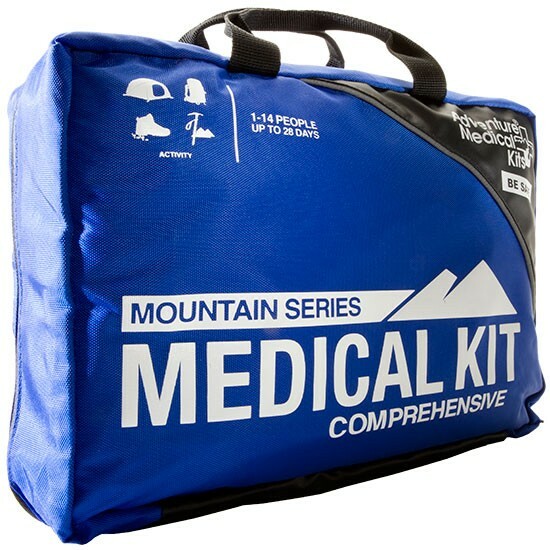 While not as “hard corp” as the mountain medical kit, the Red Cross kit is good to keep at home while the mountain medical kit is better to keep in the car.